There is much going on in the world to comment on. The province has declared a state of emergency because of the fire situation here. ATMON is very smoky, but fine otherwise. The fires are some distance off and the City is providing emergency shelter and services for those evacuated from the threatened areas. I personally do not have lung troubles (yet) and so I am doing much better than many, many people. This is a thing for which I am very grateful. I was recently witness to a facebook discussion between a bunch of women arguing about being offended by the things men call us. I am part of a women in trades group on facebook. It is nice to have this group of women, all of whom understand the many confusing, infuriating and hurtful things that happen to us on the job, along with the unique joys and successes we have. But a group of trades women on facebook is no different than a group of anyone else on facebook. Some of them are assholes. Some of them are stupid, some of them are rude, and some of them are offended. And many of them, just like the rest of us are immature enough to think that their experiences are both unique and ubiquitous at the same time. I mean, in general, I like people and I think they mean well. But we have our moments. Anyway, the argument in question was about a woman who prefers not to be called "young lady." There were women who also did not like it. There were women who didn't mind it. And some people had an opinion and acknowledged other's opinions as valid, and left it at that, and then a few who needed to convince everyone else of their opinion. I have mixed feelings on the subject and did not want to get into it there. If you don't like to be called a thing, and you ask not to be called that thing, that should be respected. Period. If someone repeatedly calls you a thing you have asked not to be called, they are a jerk. If you do not state your preference, but instead steam about it every time it is said, you are the maker of your own unhappiness. I get it: confrontation is scary and boundaries are hard and women have been patted on the head and and condescended to a lot. Many of us (me included sometimes) are afraid to get into something with a man for fear of their anger, disapproval, ridicule. But here's what I think: times, they are a changin'. Change is hard. And change is hard for all of us. And treating men like we have been treated - like they are only capable of a certain kind of response - is counter-productive. We have the right to know and state our preferences. Some men will welcome the guidance. After all, think about it: there are no words for women that some of us are not offended by, and so therefore, what SHOULD men call us? And here is another thing. I think it absolutely depends on the context. I am nearly 100. If I get called "young lady" it is probably said ironically, by someone who is kidding me. Also I like a certain kind of banter that might be called "flirting" in some contexts, but I like that banter with all people, especially clever ones. I don't mind most things people call me (even the negative ones can be applicable in certain situations). I have worked with men who called me sweetheart and it seemed like a term of genuine endearment. But there is one guy who has quite openly chauvinistic opinions who calls me sweetheart and it sounds creepy and condescending. So there's me, containing multitudes again, and trying to acknowledge the multitudes that others contain. In the main part of my life, I still have cats, and I have a garden. Let me share a little of both of them with you. This was taken July 3, before the fires got really going, but also before all the flowers really started blooming. 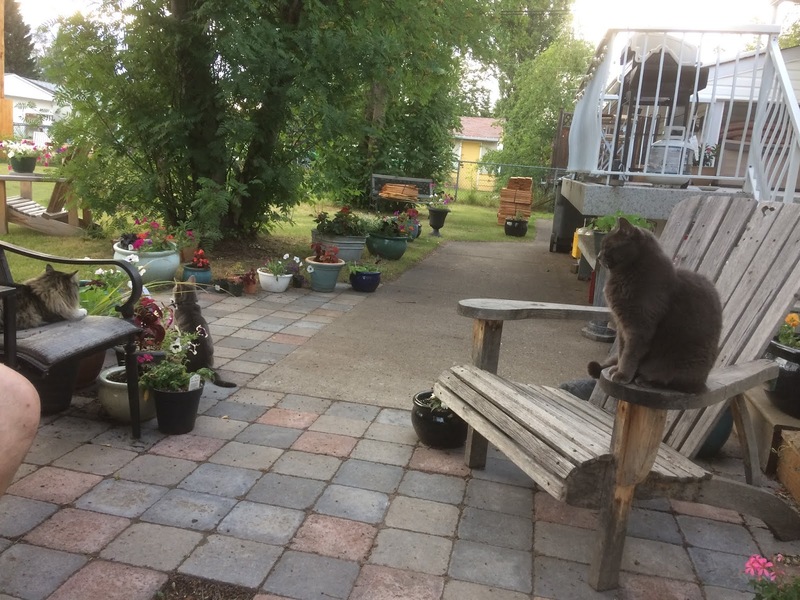 You have met Thomas, foreground right, sitting on the Adirondack chair I built in 2007, and Meili, on the far left, but you have not met Bandit, with his back to us near the flower pots. Bandit lives two doors down, but is the neighbourhood cat. He is a nice boy who is tolerated outside but treated with some hostility by Meili and Lucy if he comes in the house. He likes to come in the house and be given canned food when it is being given out (morning and night only), and play with our cat toys. He is not hungry, because I am free feeder and there are bowls of two kinds of kibble available all the time and he eschews them both. And he is not neglected attention-wise; I have met his person and he is as affectionate with her as he is with us. He is just a nice, friendly cat. We call him one of our half cats. Happy Caturday! I am so glad to see you still writing, and not in a burned-up state, and with cats and a garden, and oh, joy. I agree with you on all points but only hesitatingly on the John A. statue. Ultimately, I get it: it'd be like Jews in Berlin having to pass by a Hitler statue every day. But erasing history is dangerous, too: we can certainly live in a world that does better, but we can't live in a world that DID better. Hi Ken. Thanks for the welcome. I don't know if I have much to say, but I kind of like having a blog. And the people I know through it. I don't think we can really erase history. We can only see it through a new lens. 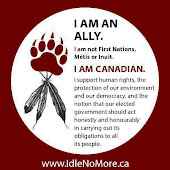 MacDonald stood in a place of respect where that respect hurt First Nations. He will be moved somewhere else, with new context. We can remember that the railroad and the nation he built, while useful and comfortable to some of us was built on the pain and subjugation of others. I hope the planet survives long enough for us to stop doing this to one another.